Fite, president and CEO of Century 21 Judge Fite Co., and his wife have done their fair share of traveling. Heights are no problem for Jim Fite. Whether it is the sky-high housing market that he’s deftly navigating as president and CEO of Century 21 Judge Fite Co. (one of the area’s largest residential real estate firms, with about 1,000 agents), or the planes that he and his wife, Petey, have been known to leap out of on occasion. The skydiving happened some 20 years ago, Fite says, while visiting his in-laws in Zephyrhills, Fla., also known as “Skydive City,” and only at his wife’s insistence. Together for the past 33 years, the couple’s travels have taken them all over the world. From escapades in Playa del Carmen, Mexico to hunting with hawks in the Scottish countryside. Adventure travel, you could say, has become the Fites’ thing. On the itinerary for 2019, the Fites already have plans to visit Cuba in January: “I’ve heard it’s a lot like traveling back in time to the 1950s. I’m most excited to see all of the vintage cars,” he says. 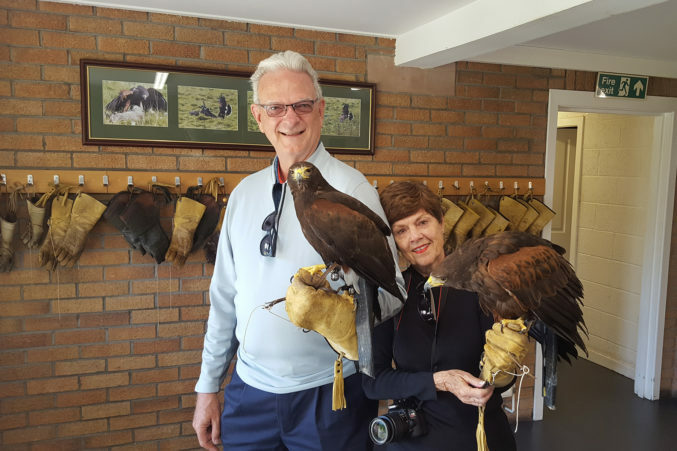 Jim and his wife Petey, hunting with hawks in Glen Eagles, Scotland. Next fall, the dynamic duo will either travel to Bangkok, Singapore, and Jakarta for a Southeast Asia tour—or they’ll be going with friends to see the gorillas of Uganda. On the bucket list remains a trip to Israel, a destination that Jim and Petey both eagerly want to see. There was the time the couple jumped off of a bridge near Victoria Falls in Zimbabwe, attached only by a bungee cord that was strapped around their ankles. Or, the time the Fites ziplined atop a jungle canopy in Central America on a “somewhat rudimentary” ropes course. But with all the adrenaline-inducing travel over the years, the one time Jim truly recalls fearing for his life was when his raft overturned while whitewater rafting the class-five Zambezi River in Africa. Luckily, Fite’s life jacket performed as it was supposed to. Local kayaker guides quickly pulled him to safety and into an accompanying raft. But he still had more rapids to get through to reach the end of the day’s adventure. And he trekked on. He recounts the experience: “The Zambezi River is in a canyon that is 250 meters, about 25-stories high,” he says. “There are two ways to get out … both involve hiking and climbing the mountain. My nerves are wrecked. I’m shaking from my near-death experience. “It’s no walk on the beach. And it’s not like there are sidewalks. The first bit is smooth walking. Next, we do this switchback hike. Then, we start hiking up and there are these steps made out of two-inch pieces of wood. I have a paddle to help keep my balance, and the group has left us at this point. “We finally get up to the mountain and there is a ladder—literally, a ladder,” Fite continues. “And every third rung is broken. We’re climbing up and we get to the top, or what we think is the top, and there are two more cliffs that we couldn’t see from below.